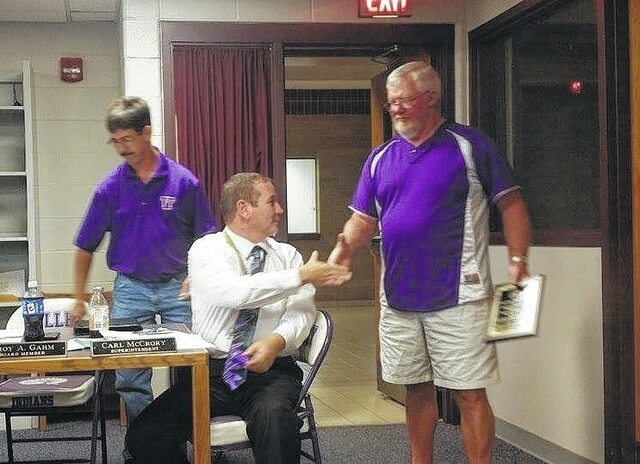 The Valley School District formally honored former softball coach Montie Spriggs at a board meeting at Valley High School on Wednesday evening. Spriggs explained that he chose to retire for health reasons. He has had health problems in the past, and he felt that it was in his best interest to avoid the stress of coaching. Spriggs also said he would continue to work at the school, especially in the upkeep of the softball field. “I’m still going to work here at the school and do the things that aren’t stressful for me,” he said. In his nearly two decades as Valley’s softball coach, Spriggs led the Indians to 241 wins, three SOC titles and three district championships. The highlight of Spriggs’ run came from 2010-2012, when the Indians won three straight district titles and advanced to the regional finals in 2011 and 2012. This season, Spriggs led the Indians to an appearance to the district semifinals, including an upset of No. 2 seeded Piketon in the sectional championship game. Joseph Pratt contributed to this story. Reach him at 740-353-3101 ext. 1932. Reach Alex Hider at 740-353-3101 ext. 1931 or on Twitter @PDTSportsWriter.